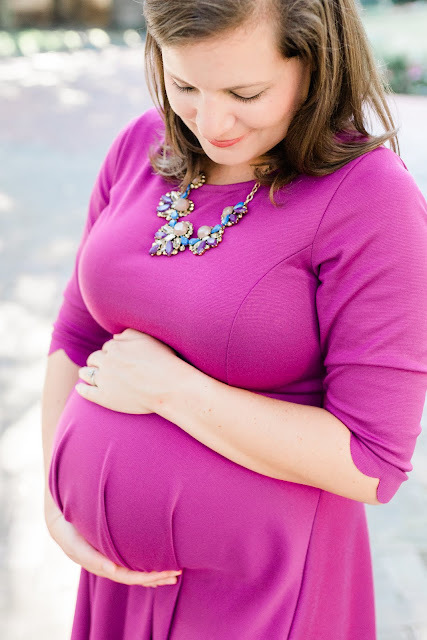 While I haven't documented too much of my pregnancy here on the blog, one thing that I really wanted to do to document it was to have maternity photos taken. Enter in Caitlyn, of Caitlyn Motycka Photography and the blogger behind Home Sweet Ruby. I've been following along with Caitlyn for years and have watched as she picked up a camera and began to take absolutely stunning pictures of her family and friends. 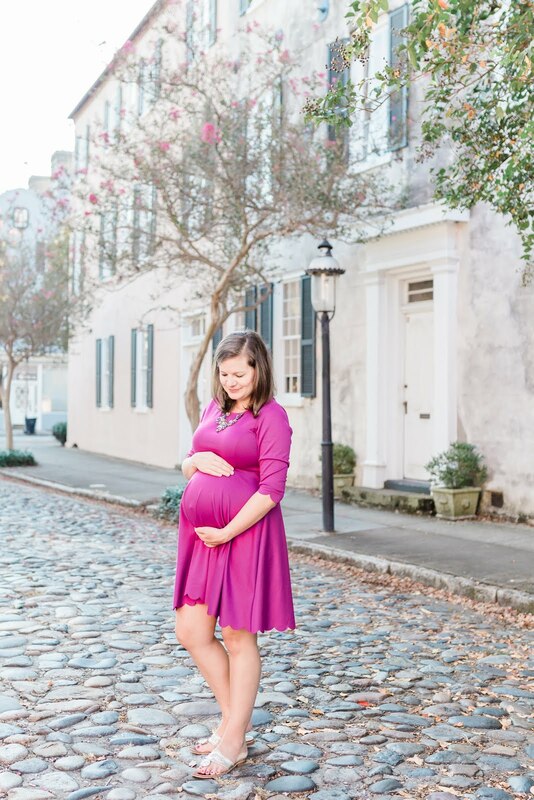 I was so excited to see that she decided to start her own business earlier this year, and immediately messaged her about taking maternity photos in downtown Charleston. Fast forward a few months, and Patrick and I met up with her early on Sunday morning in October to document this ever growing baby bump of mine. Fun fact: this particular Sunday was the very last day that I was able to squeeze my engagement ring and wedding band on my finger. My Clemson ring had to be ditched a few weeks prior and I've been rocking my Enso ring ever since. I'm just glad that I was able to wear my regular rings in these photos! We took the majority of our photos in downtown Charleston on Chalmers Street between Meeting Street and Church Street. Fair warning: this is hands down the bumpiest, roughest road to ever drive down! Extremely picturesque, but extremely bumpy. 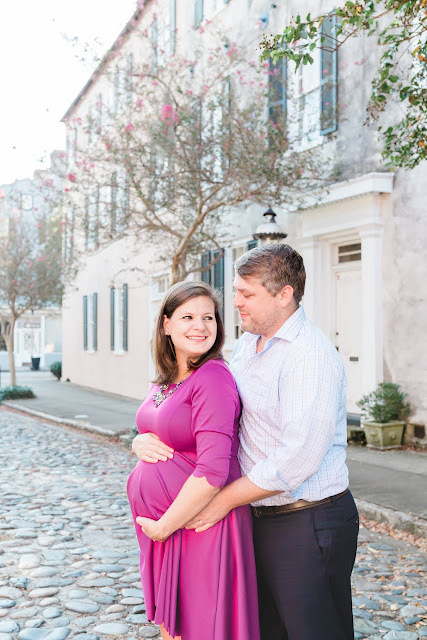 If we lived in Charleston, I'd probably make several trips down this road to try and get labor going. You also don't have to worry about being in the way of cars on this road. It isn't well-traveled, and when it is, the cars are going so slow that you can easily hop out of the way. We also ventured into Washington Square Park for a few photos. 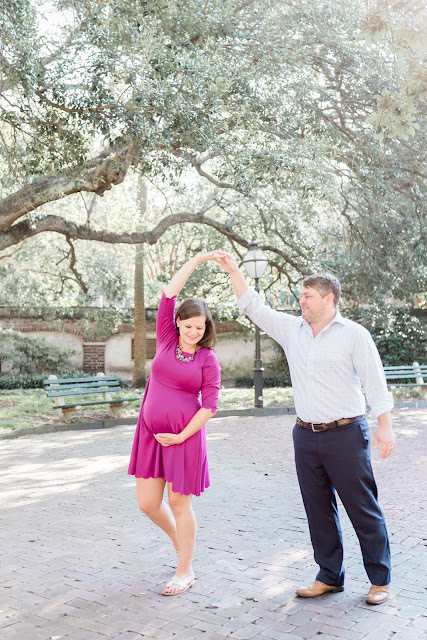 And of course, it wouldn't be a photoshoot with a professional photographer if Patrick and I didn't have at least one dancing photo. These always end up being some of my favorite and we have quite the collection going these days. If you live in the Charleston area, or if you're traveling that way, and need some photos taken of your family... I highly recommend Caitlyn! She was super easy to work with and I love how our photos turned out! You should see some of the sessions that she does down on the beach - they're stunning. Am I already mentally planning another session with her sometime next year when Baby Girl is here? You bet. 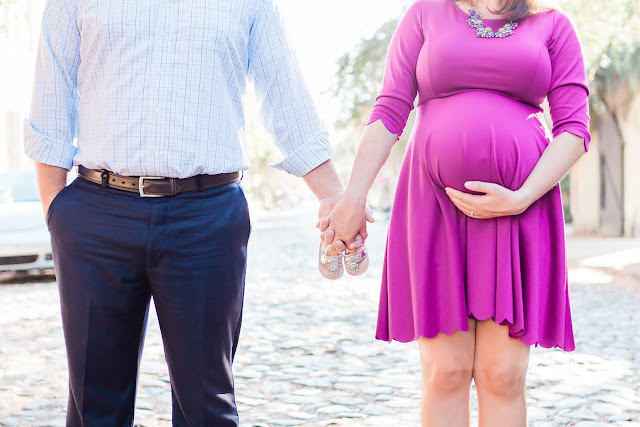 As for now... now, we're just counting down the days until we get to meet this sweet little girl! I'm so glad that you shared these!! 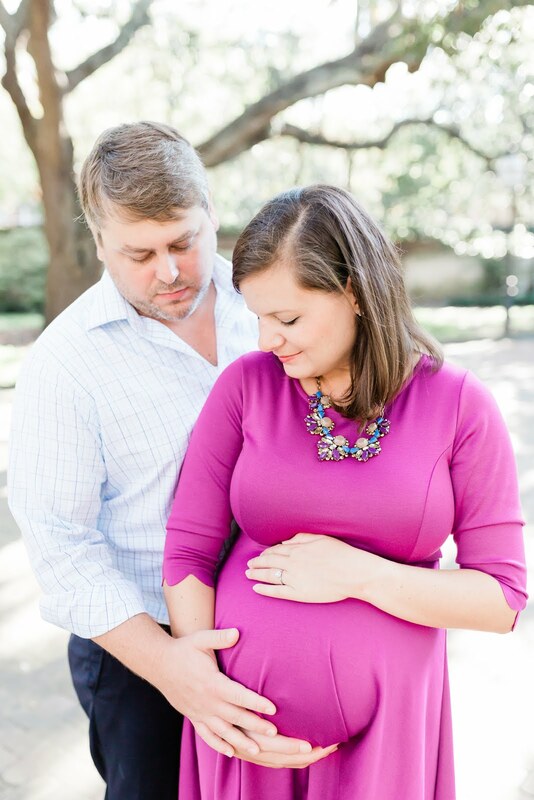 What sweet and precious memories and Caitlyn captured them perfectly for y'all! Could y'all be any cuter?! Can't wait to meet this little lady. Love y'all! Happy Due Date, Baby Girl!